Saint Photius, Patriarch of Constantinople, "the Church's far-gleaming beacon," lived during the ninth century, and came from a family of zealous Christians. His father Sergius died as a martyr in defense of holy icons. St Photius received an excellent education and, since his family was related to the imperial house, he occupied the position of first state secretary in the Senate. His contemporaries said of him: "He so distinguished himself with knowledge in almost all the secular sciences, that it rightfully might be possible to take into account the glory of his age and compare it with the ancients." 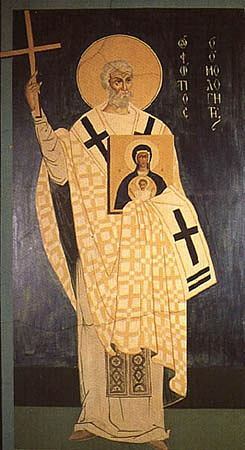 Michael, the young successor to the throne, and St Cyril, the future Enlightener of the Slavs, were taught by him. His deep Christian piety protected St Photius from being seduced by the charms of court life. With all his soul, he yearned for monasticism. In 857 Bardas, who ruled with Emperor Michael, deposed Patriarch Ignatius (October 23) from the See of Constantinople. The bishops, knowing the piety and extensive knowledge of Photius, informed the emperor that he was a man worthy to occupy the archpastoral throne. St Photius accepted the proposal with humility. He passed through all the clerical ranks in six days. On the day of the Nativity of Christ, he was consecrated bishop and elevated to the patriarchal throne. Soon, however, discord arose within the Church, stirred up by the removal of Patriarch Ignatius from office. The Synod of 861 was called to end the unrest, at which the deposition of Ignatius and the installation of Photius as patriarch were confirmed. Pope Nicholas I, whose envoys were present at this council, hoped that by recognizing Photius as patriarch he could subordinate him to his power. When the new patriarch proved unsubmissive, Nicholas anathematized Photius at a Roman council. Until the end of his life St Photius was a firm opponent of papal intrigues and designs upon the Orthodox Church of the East. In 864, Bulgaria voluntarily converted to Christianity. The Bulgarian prince Boris was baptized by Patriarch Photius himself. Later, St Photius sent an archbishop and priests to baptize the Bulgarian people. In 865, Sts Cyril and Methodius were sent to preach Christ in the Slavonic language. However, the partisans of the Pope incited the Bulgarians against the Orthodox missionaries. The calamitous situation in Bulgaria developed because an invasion by the Germans forced them to seek help in the West, and the Bulgarian prince requested the Pope to send his bishops. When they arrived in Bulgaria, the papal legates began to substitute Latin teachings and customs in place of Orthodox belief and practice. St Photius, as a firm defender of truth and denouncer of falsehood, wrote an encyclical informing the Eastern bishops of the Pope's actions, indicating that the departure of the Roman Church from Orthodoxy was not only in ritual, but also in its confession of faith. A council was convened, censuring the arrogance of the West. In 867, Basil the Macedonian seized the imperial throne, after murdering the emperor Michael. St Photius denounced the murderer and would not permit him to partake of the Holy Mysteries of Christ. Therefore, he was removed from the patriarchal throne and locked in a monastery under guard, and Patriarch Ignatius was restored to his position. The Synod of 869 met to investigate the conduct of St Photius. This council took place with the participation of papal legates, who demanded that the participants sign a document (Libellus) condemning Photius and recognizing the primacy of the Pope. The Eastern bishops would not agree to this, and argued with the legates. Summoned to the council, St Photius met all the accusations of the legates with a dignified silence. Only when the judges asked him whether he wished to repent did he reply, "Why do you consider yourselves judges?" After long disputes, the opponents of Photius were victorious. Although their judgment was baseless, they anathematized Patriarch Photius and the bishops defending him. The saint was sent to prison for seven years, and by his own testimony, he thanked the Lord for patiently enduring His judges. During this time the Latin clergy were expelled from Bulgaria, and Patriarch Ignatius sent his bishops there. In 879, two years after the death of Patriarch Ignatius, another council was summoned (many consider it the Eighth Ecumenical Council), and again St Photius was acknowledged as the lawful archpastor of the Church of Constantinople. Pope John VIII, who knew Photius personally, declared through his envoys that the former papal decisions about Photius were annulled. The council acknowledged the unalterable character of the Nicean-Constantinople Creed, rejecting the Latin distortion ("filioque"), and acknowledging the independence and equality of both thrones and both churches (Western and Eastern). The council decided to abolish Latin usages and rituals in the Bulgarian church introduced by the Roman clergy, who ended their activities there. Under Emperor Basil's successor, Leo, St Photius again endured false denunciations, and was accused of speaking against the emperor. Again deposed from his See in 886, the saint completed the course of his life in 891. He was buried at the monastery of Eremia. The Orthodox Church venerates St Photius as a "pillar and foundation of the Church," an "inspired guide of the Orthodox," and a wise theologian. He left behind several works, exposing the errors of the Latins, refuting soul-destroying heresies, explicating Holy Scripture, and exploring many aspects of the Faith.